I arrived quite late to the Nutella party (I only tasted it for the first time a few months ago), but I fell in love instantly. Despite the fact that the ingredients make me somewhat uncomfortable, I have still found myself eating it straight from the jar on more than one occasion. I know I’m not the only one who loves the stuff. A couple of words in my facebook status bar to the tune of “I’m attempting homemade nutella” got some of my friends really excited. So when my first batch didn’t go all that well (I over toasted the hazelnuts), I knew I had to try again. 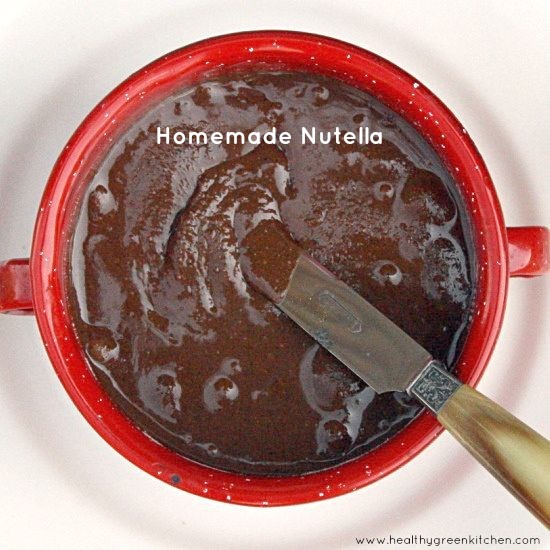 I have successfully made this chocolate hazelnut spread/homemade nutella a few times now. It’s super easy. I made one batch with maple syrup, and if you avoid sugar, you might want to try that. I personally prefer the consistency with the organic powdered (confectioner’s) sugar, but I like to remind you that there are options. You could also add a little vanilla extract or the scraped seeds from half a vanilla bean. You start by toasting the hazelnuts on a cookie sheet. Some recipes call for doing this at 400°F but this didn’t work out well for me (I over toasted them, remember?). I recommend 350°F for 10 minutes. It’s enough for them to become fragrant and for the shells to loosen, plus it ensures there won’t be any “burnt” flavor. Once the hazelnuts are toasted, you need to rub the skins off. Kind of a pain, but it’s got to be done. You can use a towel, but I just use my fingers. If they don’t all come off, don’t worry about it. From there, you just whir the hazelnuts into a butter in your food processor and then add the rest of the ingredients. Process again until you’ve got a delicious chocolate hazelnut spread. I’ll tell you right now that this does not taste exactly like Nutella. It’s not quite as sweet and it’s not as smooth (because it doesn’t contain as much sugar, questionable oils, or emulsifiers). But it’s pretty close. And it’s better for you. I used raw chocolate (aka cacao) powder , but any high quality, preferably organic, cocoa powder (like the Rapunzel brand) will do. A little oil helps to make the finished product spreadable. I used organic coconut oil . Coconut oil is only liquid when it’s warm out (which it was when I made this). If your coconut oil is hard (and it you plan to store the finished nutella in the refrigerator, you might want to use organic grapeseed oil (or if you’ve got hazelnut oil, you could use that instead). Note that you really need to use a food processor to make this recipe. I tried it in my Blendtec blender and it just didn’t work. I don’t like dragging my food processor out any more than you do, but I promise it’s worth it. 1. 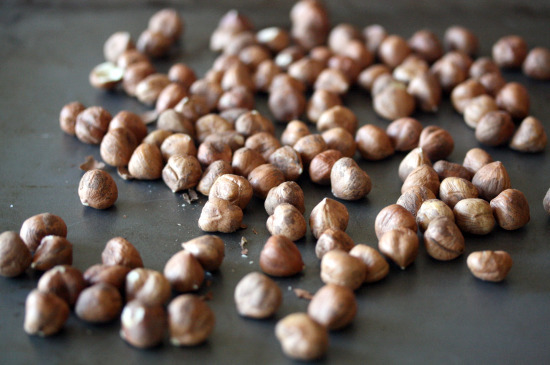 Place toasted and skinned nuts in a food processor. Process until the nuts turn into a smooth paste (you may need to scrape the bowl a few times so all the nuts get ground up evenly...this takes a few minutes). 2. When the nuts have been processed into hazelnut butter, add the powdered sugar, cacao/cocoa and sea salt. Process again until smooth. 3. Add the oil and process once more. 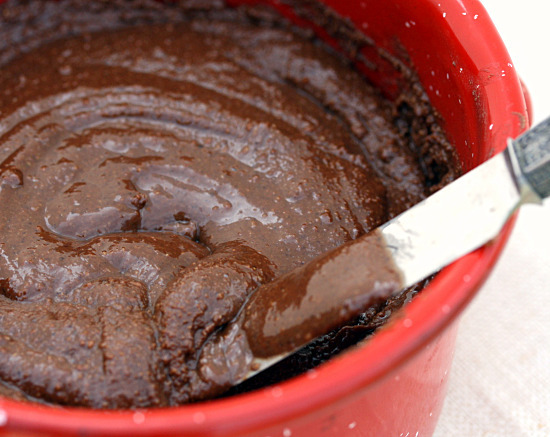 Your homemade nutella should now have a spreadable consistency. 4. Transfer your chocolate hazelnut spread to an airtight container. Storing it in the refrigerator will make it harden up and it won't be easy to spread, but that's the best place to store it if you want your homemade Nutella to last for a while. If you think it will get eaten up in a few days, you can store it at room temperature. Homemade Nutella is great as a dip for fruit, spread onto your favorite bread, or, let’s be honest, eaten straight with a spoon. This post is linked to Slightly Indulgent Tuesday (June 8, 2010) over at Amy Green’s Blog: Simply Sugar and Gluten Free. Mmmmm, I think the homemade version is so much better:) I used the L.A. Times recipe too. Didn’t you love the aroma of the roasted hazelnuts? :) Looks great! What a great and delicious idea! I love nutella on bread. I’ll have to try this one! Wow wow wow. I’ll admit to the “out of jar eating.” Thankfully, my guilt is low because my husband takes full responsibility in restocking the pantry. I’ve got hazelnut oil, so I’m looking forward to trying this more naturally sinful version. I’m sure it was difficult retesting this recipe, but it was for a good cause! Love it! I am definitely a Nutella fan and I appreciate this healthier version. Mmm, this looks delicious. I haven’t eaten nutella for years and years, but this has inspired me to try it. As I child I used to love chocolate spread, which was like nutella but without the nuts – not very healthy at all, but so, so tasty! Nice! I haven’t had Nutella since returning to the US after living for years in South Africa, where it’s very popular. I love this homemade, healthier version, which looks surprisingly easy to make too. This sounds great! Thanks for taking the time to make on of my favorite things healthy. Excellent job. Can’t wait to make some. Oh wow thanks so much for sharing this! I became a nutella addict in college but then when I started eating better, I dropped it from my rotation. the idea of making a homemade version is too wonderful to say no to! What a great idea! I love nutella, but I can only imagine how much better this homemade variety tastes. Thanks love! I’m going to have to get on the bandwagon. I’ve been hearing so much about Nutella but haven’t given it a go yet. You have pushed me over the edge with the “homemade” variety. Count me in! Oh my gosh thank you for this recipe! Nutella’s amazing but I’m always turned off from the unhealthy claims. This looks great. My kids love nutella but I hate buying it for them. This seems like a very tasty compromise. Great idea to get rid of those weird stablizers and emusifiers. I love Nutella! I have never made it but I think you have inspired me.It’s so expensive the way daughter goes through it. hmmmmmmp… It’s a amazing idea that everybody can follow.. yeehaw.. I have to try this..!! I love nutella.. I never thought about making my own but why not? Your recipe looks smashing and oh so easy. Thanks! This could be dangerous. I love Nutella. Love the new site design. Thanks Barbara on both counts! I love that you did this! I have a soy allergy and am unable to eat Nutella, plus I like to avoid processed foods when possible, so the thought that I could make this on my own is lovely! Thank you so much for sharing! I can’t wait to try this! Hubbell and Hudson has a hazelnut/carob chip machine that works like the machine that makes fresh peanut or almond butter. And you’re right, it doesn’t taste exactly like Nutella, but it’s delicious and so much better for you because it’s only the nuts and the carob chips. Thanks for sharing this recipe! 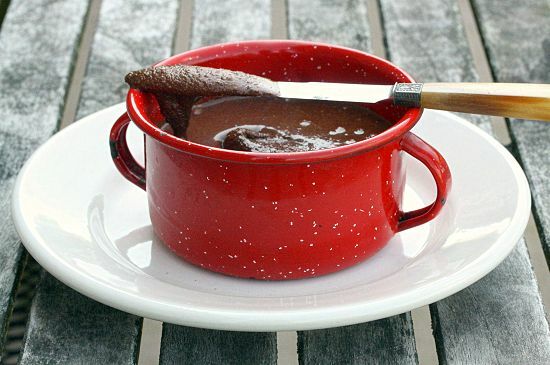 Just featured this recipe on Chocolate for Breakfast. It’s “healthy chocolate” week and after sampling a whole lot of chocolate this week, I’m so happy to find your blog! I love everything about this post, especially the gorgeous pictures. I used honey for a sweetener and I really liked it. Also, I soaked my nuts before roasting them to make this even more healthy. It came out great!